Now your caret position would be somewhere at the beginning of line 2, but the whole text box is not scrolled to the first character position, and horizontal scroll bar position is not changed (see attached screenshot). If you move your caret back to line 1 ending, and move with arrow keys to line 2, the bug will appear again (it does not matter whether right or down arrow key will be used). If you write at least one character at line 2, the bug could not be reproduced. 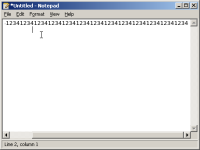 I've also checked ReactOS Notepad on Windows, and couldn't reproduce the bug here, so the notepad is not guilty. Also don't know whether it's a regression, feel free to test old revisions.